Photokina is coming…can you tell? Every two years, camera manufacturers descend upon Cologne, Germany to push their latest wares. In the past week, on the lead-up to the trade show, Nikon, Sony, and Canon (in that order) have unveiled their latest offerings. 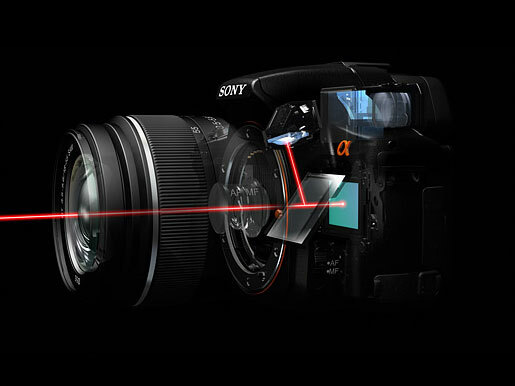 The Sony pellicle mirror diverts 30% of the incoming light to a phase-detect autofocus sensor. Image from DPReview.com. The more interesting announcements, to my mind, include Sony’s decision to revive the Pellicle mirror concept in the form of a “Single Lens Translucent” body that is always in live view, but retains phase-detect autofocus even for video. Canon has announced a new 60D body that loses many of the features that it’s predecessor, the 50D, had but it gains video and an articulated LCD screen. I can only hope that articulated screens are found on every future body that shoots video…Note also that this camera has another edge over the higher-priced 7D: manual audio control. Canon has yet to release firmware to give the 7D the capability to control the audio level, but this lower-priced model might actually become very attractive to videographers for the articulated screen combined with audio control. That is, if Sony doesn’t steal the show. 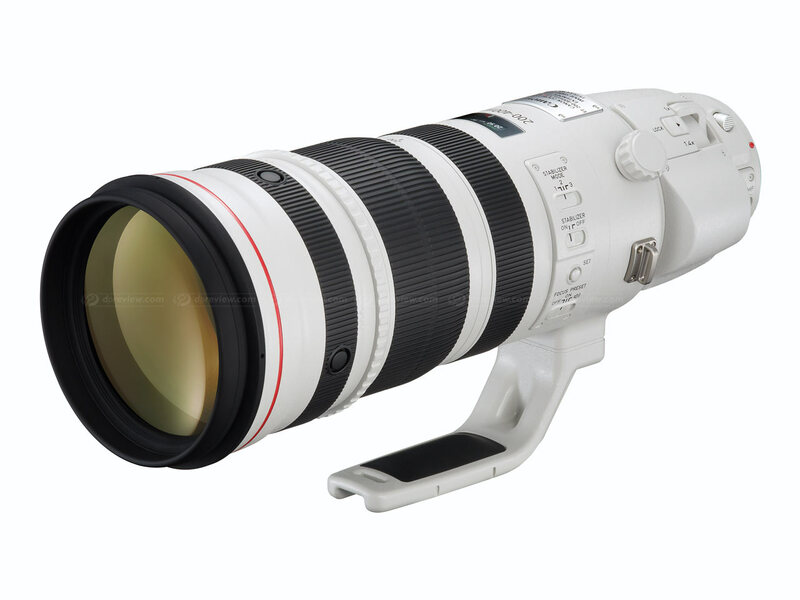 However, Canon didn’t end there: the 300mm f/2.8L, 400mm f/2.8L, and 1.4x and 2x teleconverters have all been refreshed with new optical designs. The updated teleconverters have improved electronics that might only affect their performance with the newly-announced telephoto lenses, but the improved optics should benefit all telephoto lenses. So, while I can’t say that any of the super-telephoto lenses are in the cards for me at the moment (the longest lens I have is the 400mm f/4 DO IS, and my sights are set on the 800 f/5.6–some day) the new teleconverters are sure to pique the interest of everyone as they are a frequently-used accessory and are therefore an easy way of improving the image quality of one’s photographs. Also, Canon announced that they will be redesigning the 500mm f/4L IS and 600mm f/4L IS super-telephoto lenses, complete with the new “flourine coatings” on the aforementioned lenses and teleconverters. 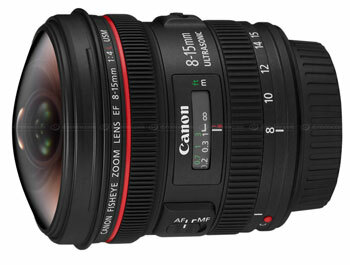 Canon 8-15mm f/4L fisheye zoom lens. Image from DPReview.com. That said, the icing on the cake of the announcements? An 8-15mm fisheye zoom. Sure to be of interest to a lot of people for the creative perspectives offered in such a range. Particularly, owners of reduced frame (APS-C and APS-H) cameras will be interested in this lens for the wider perspective. Really, the only offering in that mix that doesn’t make sense to me is the 70-300mm f/4-5.6L zoom lens. I know that the 70-300 range is popular, but how this lens fits on the totem pole in relation to the 70-300 f/4.5-5.6 DO IS lens is something of a mystery to me. I was curious enough about this “L” version of the popular zoom range that I fired off an e-mail to Scott Andrews, the photojournalism representative for Canon in North Carolina, and his estimate is that this lens will have greater contrast and sharpness as compared to the DO lens. It is, however, heavier at 2.3 pounds versus 1.6 pounds, bright white as opposed to matte black, and will be priced some $200 more than its DO sibling. I do wonder if this is Canon’s way of tiding people over while we all wait for an update of the 100-400mm zoom…provided it’s even coming. 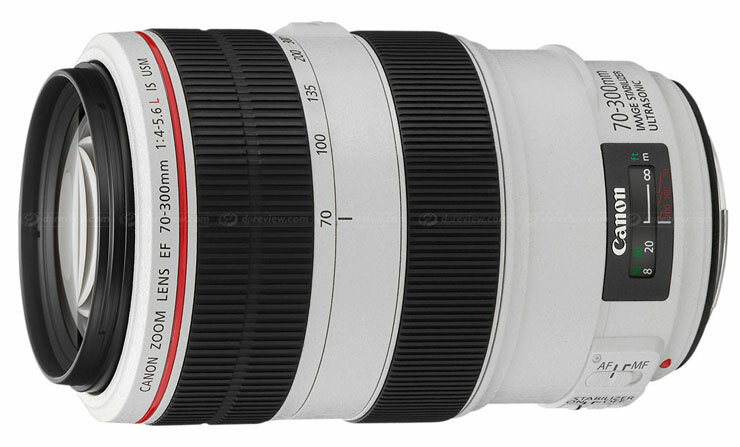 Canon 70-300mm f/4-5.6L zoom lens. Image from DPReview.com. A belated Happy Thanksgiving to American readers of this blog. 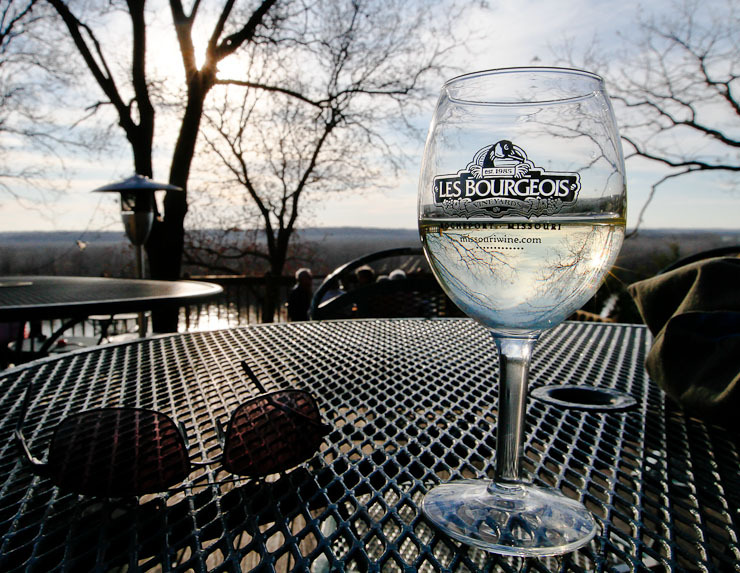 Here in Columbia, Mo., the weather has been ridiculously warm, with today reaching 71 degrees Fahrenheit. The past few days have been fairly relaxing–a welcome reprieve from the rest of the semester. I have mostly been using the 7D to continue my evaluation of the body. Of particular interest to me was the usefulness of the new built-in wireless transmitter for the Canon speedlite system, shadow noise, and live-view functionality. Fans wave glow sticks on the balcony of the Blue Note at the start of the Bassnectar concert, fashioned to be like a rave party, on Friday, Nov. 20, 2009 in Columbia, Mo. / Canon 7D and 24-70mm f/2.8 L lens @ 24mm; exposed 1/8 sec. @ f/2.8, ISO 4000. 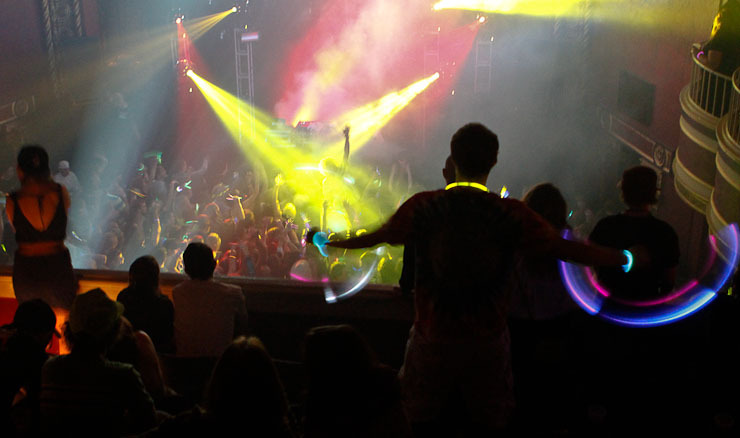 Last Friday I was assigned by Vox Magazine to go to a pseudo rave at a Bassnectar concert held at the Blue Note, a theater-like venue here in Columbia, Mo. I decided to pack the 1D Mark III and the new 7D, leaving my 5D II on the shelf at home. While it is a great camera in low light, I was more interested to see how the other two would perform as they are both relative “unknowns” to me. Risky? Sure. But I figured it made sense to have one pro body with me, and my own 1D IIN is terrible in poor lighting conditions. The only rule imposed on me was “no flash.” This was going to be ISO 3200+ territory. More photographs after the jump! I began to write this from up in the press box at the Bill Snyder Family Stadium. 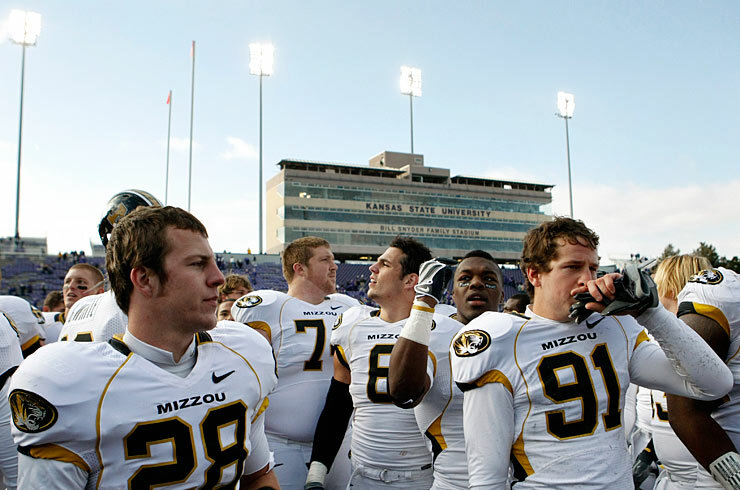 The game had ended a couple of hours before–Missouri won 38 to 12, with most of the points racked up in the second half. I used two camera bodies (initially I planned to use three, but I loaned my 1D IIn to my colleague whose camera was down to half battery before the game even started): my new 7D, and a 1D Mark III on loan Canon Professional Services. While I don’t like many parts of the Mark III, especially the way in which one chooses the focusing point, and I am wary of its ability to autofocus given its less-than-stellar history in this regard, I love the way that files look from the Mark III. And, besides, it’s about to be replaced with Mark IV bodies, so I figured I’d give it a chance as the used market is about to be flooded with them. And wow, was I surprised. 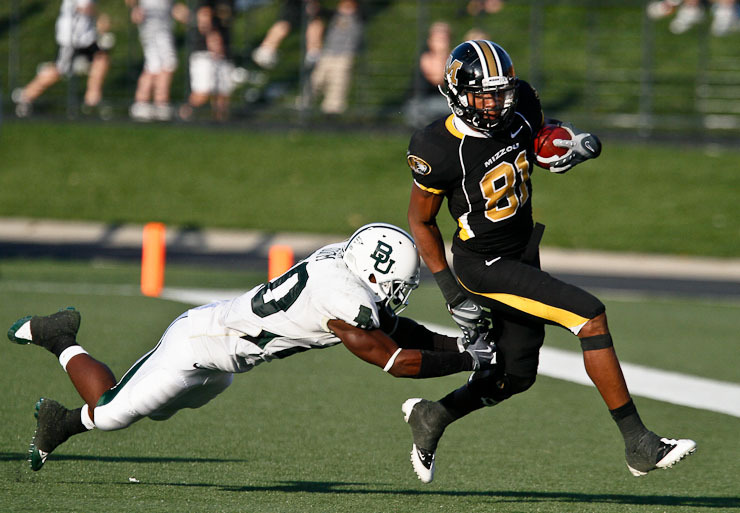 Baylor Bears’ corner back Clifton Odom dives unsuccessfully for Missouri Tigers’ wide receiver Danario Alexander at Faurot Field in the third quarter of the game on Saturday, Nov. 7, 2009 in Columbia, Mo. 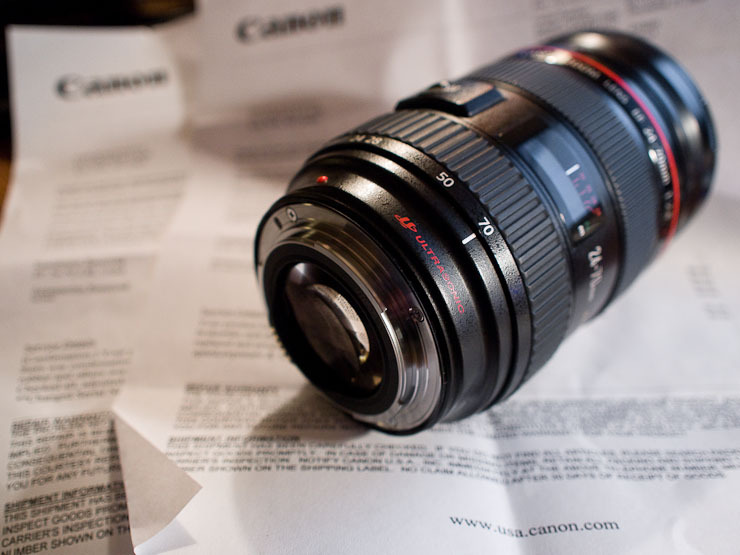 / Canon 7D and 400mm f/4 DO IS lens; exposed 1/3200 sec. @ f/4, ISO 500. I have not yet formed a clear idea in mind of what I think of the performance of the new Canon EOS 7D dSLR. I purchased it specifically for action photography–sports and wildlife–to accompany my aging 1D Mark IIn, and I photographed the college football game between Missouri and Baylor with these two bodies this past Saturday. I made about 800 frames on the 7D (about 700 too many), and was happy with the focus on several, but certainly not all of the frames. I will be photographing another football game this weekend, Missouri Vs. Kansas State, to be held in the “Little Apple.” I will go into further detail about what settings I am using in a future posting, but I will make a few remarks about the camera here. Missouri Tigers’ quarterback Blaine Gabbert attempts a pass while the Baylor Bears’ Jason Lamb dives after him during the second quarter of the game. / Canon 7D and 70-200mm f/4 L IS lens @ 183mm; exposed 1/3200 sec. @ f/4, ISO 400. Without question, I think that this camera feels better in-hand than any other, with the exception of the 1D series. The grip is, for once, contoured for a person’s hand. It is very well constructed, and the buttons are easy to find and also “stick out” a bit more so that a gloved hand can actually manipulate them. As a native of the Midwest, this is particularly important, as our winters seem to last about six months! Strangely, while virtually every button is improved over the xxD series, the depth-of-field preview button has taken a turn for the worse. It is almost flush with the camera body, and does not push in very far. Disappointing. The viewfinder is a joy to look through with this camera. Not quite as nice as the 5D II (which, frankly, is not as nice as Sony’s Alpha 900 viewfinder), but worlds beyond the 40D or 50D. So far I am unimpressed with the RAW/JPEG button, which enables whichever format you are not using by default, but only for one frame. 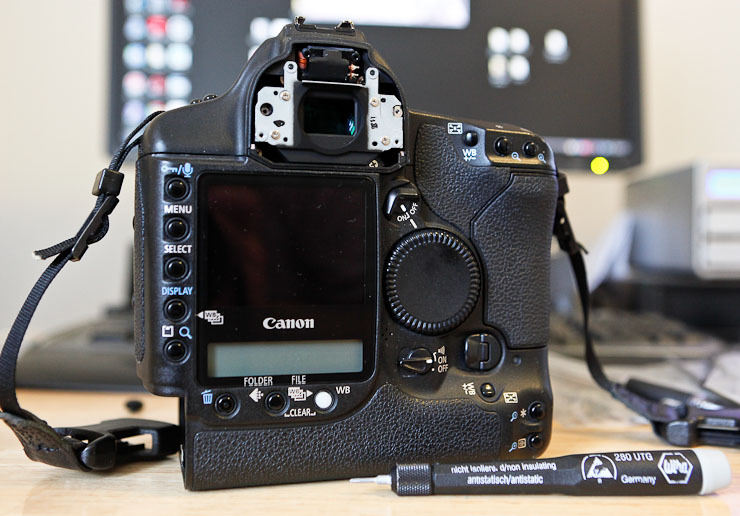 Nevertheless, it is better than the “direct print” button than it was in the original 5D, and I suppose I should be thankful because it could well have returned to that state of stupidity when Canon moved the “Live View” button from that position, where it is on the 5D II, to a spot above the joystick controller. What I will also state, to a great deal of dismay, is that this camera feels worlds better in-hand than does my 5D Mark II, which carries a $1,000 premium over the 7D. A month after an opportunity arose to purchase a Canon 7D locally (I simply wasn’t ready, and there weren’t many reviews of the camera at the time), I have pulled the trigger and a 7D body is on its way from Robert’s. I will be photographing the Mizzou Tigers’ next two football games against Baylor and Kansas State, and will report back on my experience with the body afterwords.